In the first part of this chapter, I discuss the general process used in designing web graphics as well as some terminology and details related to web image file formats. Then, I move on to tips identifying how to define each piece of your mockup and save each in the best file format for the job. In Chapter 4, I discussed using Photoshop as a web page layout tool. For professional web designers, this typically involves creating mockups that clients will review before the page is actually "built" and coded. After those mockups have been approved and are ready to be produced, it's time to slice and dice your files—literally. This means you have to translate the various pieces of your mockups into web-readable formats that can be rendered by a web browser. 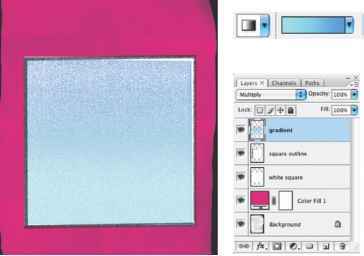 • Photoshop provides tools for creating and manipulating static images for use on the Web. You can divide an image into slices, add links and HTML text, optimize the slices, and save the image as a web page. • ImageReady provides many of the same image-editing tools as Photoshop. In addition, it includes tools and palettes for advanced web processing and creating dynamic web images like animations and rollovers. So, when it comes to designing my web pages, I typically use Photoshop. However, when I'm ready to process the web designs and save each piece as a compressed file capable of being displayed in a web browser, I usually switch to ImageReady. Ultimately, the decision is your own, and the only thing for which you definitely have to switch to ImageReady is the creation of animation and interactivity like rollovers. When you save web graphics in Photoshop or ImageReady, you have the option to allow the program to automatically generate HTML code according to the design layout. If you don't know HTML, this can be a particularly useful tool. And even if you do know HTML, having Photoshop generate it for you on the fly can save valuable time in getting files on the Web. As a die-hard HTML coder, I must advise that you use a bit of caution when allowing any application—be it Photoshop, Image Ready, Microsoft Word, or another—to automatically generate HTML for you. Applications that automatically generate code must be programmed to do so, and as such are generally not as flexible as you might be if you were coding the HTML yourself. For example, such applications often overcompensate for the amount of code needed to render a particular page, and can therefore generate significantly larger HTML files than are necessary. This can translate into longer downloads for your users. My point is that you should inspect any HTML code output by Photoshop to confirm that it serves the needs of your users as well as it can. In addition, I recommend you familiarize yourself with what you can and can't do using HTML (if you haven't already). In fact, I wrote HTML: A Beginner's Guide (McGraw-Hill/Osborne) for just that purpose. • Write your own HTML using a plain-text HTML editor such as Barebones BBEdit (www.bbedit.com) or Macromedia HomeSite (www.macromedia.com/software/homesite/). • Let Photoshop or ImageReady output the HTML for you based on your design layout and defined slices. • Integrate the development process with a What You See Is What You Get (WYSIWYG) HTML editor such as Adobe GoLive or Macromedia Dreamweaver.